Top This (Cherry on the Cake in British English) is a General minigame in Mario Party: Island Tour. 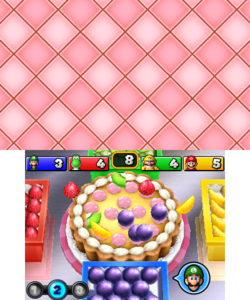 A brief demonstration shows the first player adding three pieces of fruit to the cake. The game is then restarted. Each player has one kind of fruit topping in their bowl: the first player has blueberries, the second has strawberries, the third has kiwifruit slices, and the fourth has tangerine slices. In each of the three rounds, there will be a spinning cake on the bottom screen with sixteen spots on it, and competitors must try to add as many pieces of fruit as they can to it. After ten seconds pass, or when every spot on the cake is occupied, the round ends and a new round, which may have a different cake, begins. The winner is the player who has added the most toppings in total at the end of the game. Rules – American English "Decorate the cake with as many pieces of fruit as possible." Rules – British English "Decorate the cake with your fruit on the pink icing spots."